I want to take a minute to speak on the legacy of my father so you better understand where I come from. In 1985, my father was approached by Peter True, owner of Cheshire, Connecticut's “True Refinishing”, with a business proposal. Mr. True was moving to Florida and offered to sell Normand his refinishing business of 14 years. Normand had been working in the aerospace industry and leapt at the opportunity to become an entrepreneur and spend more time with us, his family. Normand was the son of a French-Canadian carpenter, and grew up with a love of building and fixing things. Normand was happiest when he was working with his hands on a challenging project such as repairing a broken chair, fixing a small engine, or even restoring and antique car. In 1986, Cheshire Furniture Refinishing (CFR) came into being in the garage of my childhood home on Old Waterbury Road in Cheshire, Connecticut. At first business was slow, but as time went on, word of mouth spread through Cheshire and all over the state of Connecticut of the quality work that CFR produced. With an increased customer base, CFR outgrew its initial home and relocated to a small commercial building on West Main St. in Cheshire. More employees were taken on to alleviate the greater demand now being placed onto CFR. The new and larger facility allowed for a new business venture into antique sales, and "Memory Lane Antiques and Furniture" was opened. As time went on, the desire grew to purchase a permanent shop location. The search ended in 1991 as my family and CFR moved around the corner from West Main St to 43 Willow St. Then in 2000, I officially joined the CFR team. With a back-ground in art and a passion for fine style and design, I did my best to bring a fresh new perspective. 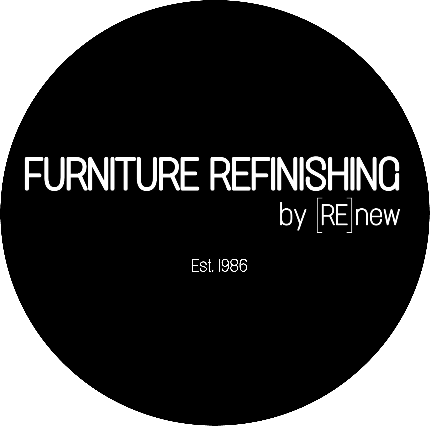 Initially viewing CFR as a “stepping stone” to future ventures, I never intended on making furniture renewal my permanent career path. However, after only a few years of working for my, I fell in love with the craft and found the art that made furniture renewal so exciting and rewarding. In 2005, my Dad and I officially became partners in 2005 and then in 2010, I took over the business completely. Today, though under a new brand name, I continue to strengthen the reputation as Connecticut’s premier furniture refinishing company that my dad began all the way back in 1986. Working along-side interior design professionals, architects, antique-lovers, and fine furniture enthusiasts, [RE]new furniture works with our clients to create the perfect final result. [RE]new furniture is much more than just a furniture refinishing business. Everyday I wake up excited to work on the next project with my team. Sometimes it's a commissioned furniture renewal project for a client or sometimes it's a piece that came to me in dream that I need to bring to life. Then other times it's working with one of the fantastic artists I collaborate with to add their creative skills to a project to create something truly amazing. We believe in giving each project the creativity and craftsmanship it deserves. We are a small design studio that is building a legacy one project at a time. We call these creations LIFE ELEMENTS. They are those items that we build our lives around. For example, the other day I was in a client's home and she showed me this small drawing of a clown that was crying. It was framed and hanging proudly on the wall near her desk. It was really cool and then she told me her son, now an adult, drew it when he was 11 years old. This is a perfect example of LIFE ELEMENT. for visiting our website and taking a minute to find out more about [RE]new furniture. [RE]new furniture is much more than just furniture refinishing business. Everyday I wake up excited to work on the next project. Sometimes it's a commissioned furniture renewal project for a client or sometimes it's a piece that came to me in dream that I need to bring to life. Then other times it's making a phone call to one of the fantastic artists I know to add their creative skills to a project to create something amazing. What happens in our [RE]new studio often feels a bit like a magic show or a circus. Things that seem unable to be explained or at times a bit haphazardly executed by an onlooker are far from either conclusion. We believe in giving each project the creativity and craftsmanship it deserves. We are a small design studion that we call a of creative and talented artists and professional artisans looking to create amazing things that make us smile and hopefully others as well. We call these creations LIFE ELEMENTS. They are those items that we build our lives around. For example, the other day I was in a client's home and she showed me this small drawing of a clown that was crying. It was framed and hanging proudly on the wall near her desk. It was really cool and then she told me her son, now an adult, drew it when he was 11 years old. This is a perfect example of LIFE ELEMENT. After taking over my father's furniture refinishing and restoration business, I realized that I was not truly tapping into my deepest passion. It was then that I set out to create a company that encompasses five main spirits through which all of what we do is inspired by.